Rev. 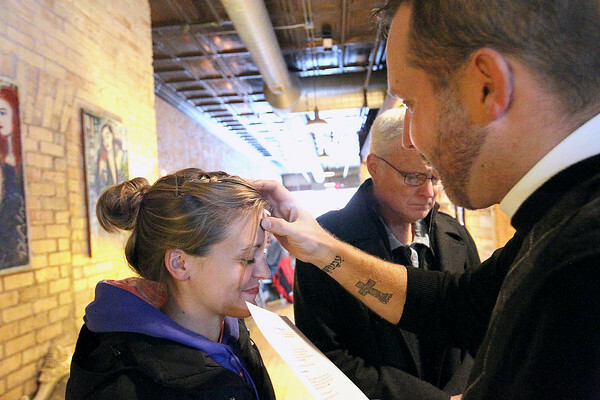 Justin Grimm of Advent Lutheran Church in Lake Ann places ashes on the forehead of Danica Makowski during an "Ashes to Go," imposition of ashes for Ash Wednesday service inside Brew in Traverse City. Grimm held the morning event for the second year after hearing of the idea from pastor friends. The day marks the beginning of Lent in the Christian faith, a period of fasting and repentance and self-discipline leading up to the Easter holiday. Ashes placed in the shape of a cross on the forehead symbolize humility, mortality and repentance.